We are counted amongst the respected Manufacturers, Exporters and Suppliers of Pre Compressed Spring Hanger (50 mm). 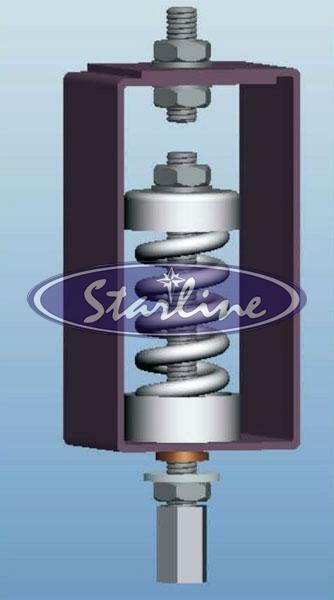 It is widely applied in the suspension of water pipelines and in seismically restrained rotating equipment. Pre Compressed Spring Hanger that we offer is highly appreciated for its sturdy construction, high strength and excellent performance. Furthermore, we make available bulk quantities of Pre Compressed Spring Hanger at very reasonable rates. Suspension rod misalilgnment (30 degree arc) is compensated in hanger design. Printed deflection scale to indicate total spring deflection. 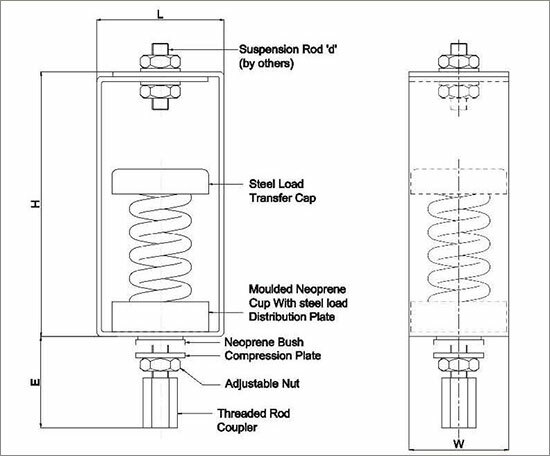 Pre compressed spring effectively minimizes transfer of variations in pipe load during of pipes thus protecting equipment connections / flexible joints and also prevents overloading of the main equipment isolators.